Lightweight, super breathable, minimalist gaiters that keep your feet and socks in good condition. 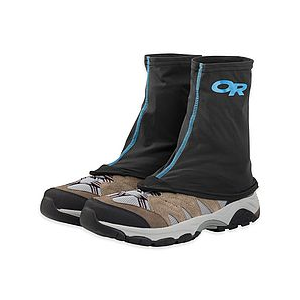 The Outdoor Research Spark Plug Gaiters are minimalist gaiters that prevent debris from entering your shoe. This means less emptying out of shoes, longer usage out of your socks, and happy hiking or running. 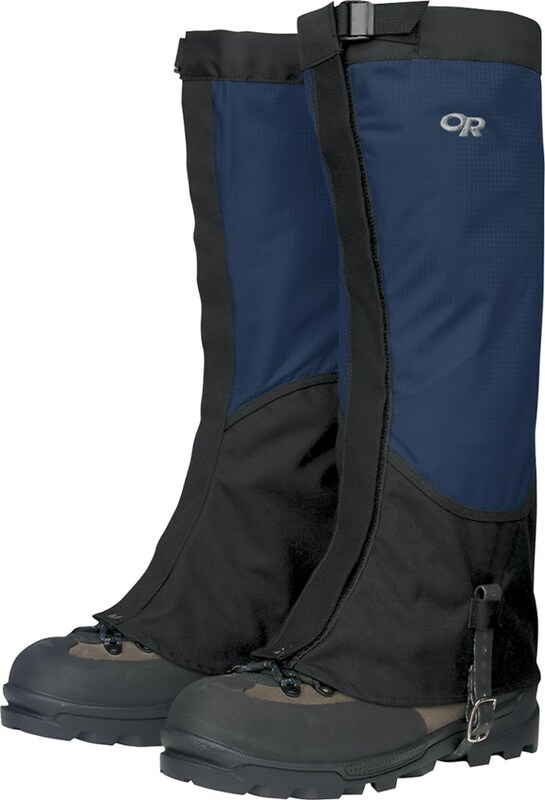 I have a size L/XL gaiter, over my EU46, JP29.5, US11.5 sized Salomon X Ultra Mids. I think the fit is perfect. I can reach all the way to the front most lace with the hook, or back off if I would have a higher volume shoe. My L/XL Spark Plugs weigh in at 33gram (1.16oz). The Spark Plug Gaiters are very similar to the Dirty Girl Gaiters. I do find these to have some small, albeit useful changes — at least for me. The volume of the Spark Plugs is a bit bigger. That means that for the same length, the Spark Plugs are a bit roomier, so they accommodate both low-cut trail runners as well as mid-cut hiking shoe/trail runners well. Although the front closure system on the Dirty Girls worked fine, on the Spark Plugs it works just a bit better. It is slightly more robust, and the hook just latches on to my laces a bit easier. The Spark Plugs breath well and do what they need to do, keep debris out of your shoes. They are not intended to be waterproof (which is why they breath so well). Even if it is very hot out, you will hardly notice they are there. They fit very nice around my ankles, not too tight, which I prefer for long days on the trail. The back velcro though small, stays put like it should. Some people find the top tends to slide down a bit, which I have had happen as well. To counter this Outdoor Research has added to small loops on the inside that you can run a thin shock cord through (though this cord is not included). I haven't found the need myself, because at least in my case, when the gaiters sag, they still cover my shoes - keeping out the debris. So I just let them rest where they do. Soaked (GTX-lined) shoes, socks, and gaiters. Notice sagging on the right. Keep in mind that this photo is taken during heavy rain - everything is soaked and covered with some mud and sand. 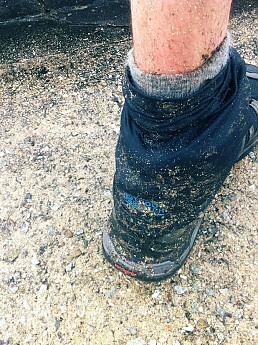 During dry conditions the gaiters would ride down somewhat, but stay above my socks. During a long day in continuous sustained rain I would find some debris end up in my shoes, but the trail was such a mess it is hard to imagine other gaiters perform better, or that some of it didn't just plain enter through the shoes themselves. Outdoor Research has only included one velcro pair with these. I think that is a bit cheap. Of course it is easily remedied by getting your own velcro, but out of the box you should be able to use these immediately with at least two different pair of shoes. A lot of people rotate shoes, or use different shoes for different runs or hikes. I think they could have also added two bits of shock cord, to add to the little loops on the inside. I'm very happy with the performance of the Spark Plug Gaiters. They're easy to put on and off, breath well, and keep my feet happy. Even in heavy continuous rain they work well to keep my shoe system in the best condition they can. 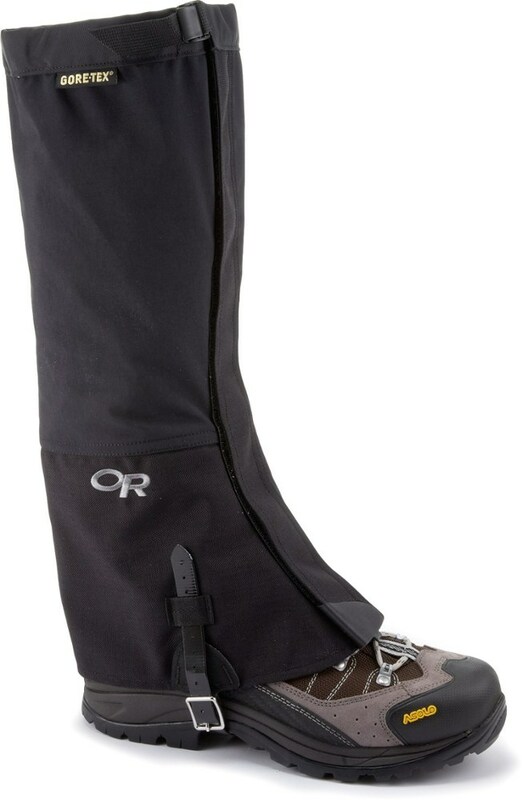 If you are looking for very breathable, minimal gaiters, these or the Dirty Girls will do a great job. Nice review. I would want the cord to hold them up. Yeah, I think the best way would have been if they had just made a hem on the top with a thin cord running through it that you could cinch down. I like it a bit loose but can very well imagine people wanting it a bit more snug. 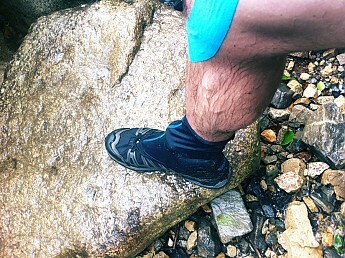 On a multi-day hike, I want my gaiters to keep my socks clean. Yeah, the sagging seems to defeat the purpose a bit. Great review and thanks for the "food for thought" Jakuchu! Perhaps you are right. I don't know if I was clear in the review but they did work well in not allowing any debris in. They also only sagged below my socks during the crazy rains here in the Japanese rainy season. On dry days they didn't expose my socks. I think it has to do with the fabric that is so thin as to not have that extra stiffness to hold them up. And I also think they should have just hemmed down the top and added a thin cinch cord and they wouldn't have had this problem. 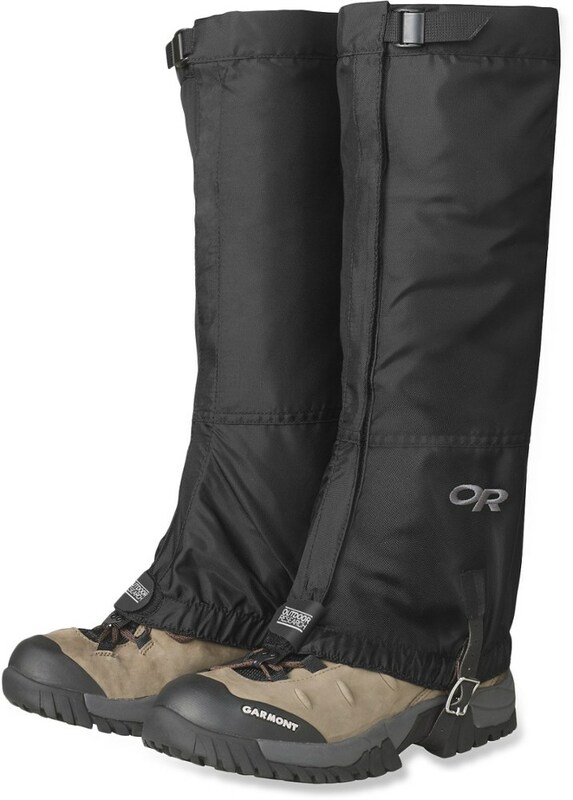 For a thicker one (that were too thick for me, but could still be a good alternative for others) check out the OR Ultra Trail Gaiters. Nice review, Jakuchu! 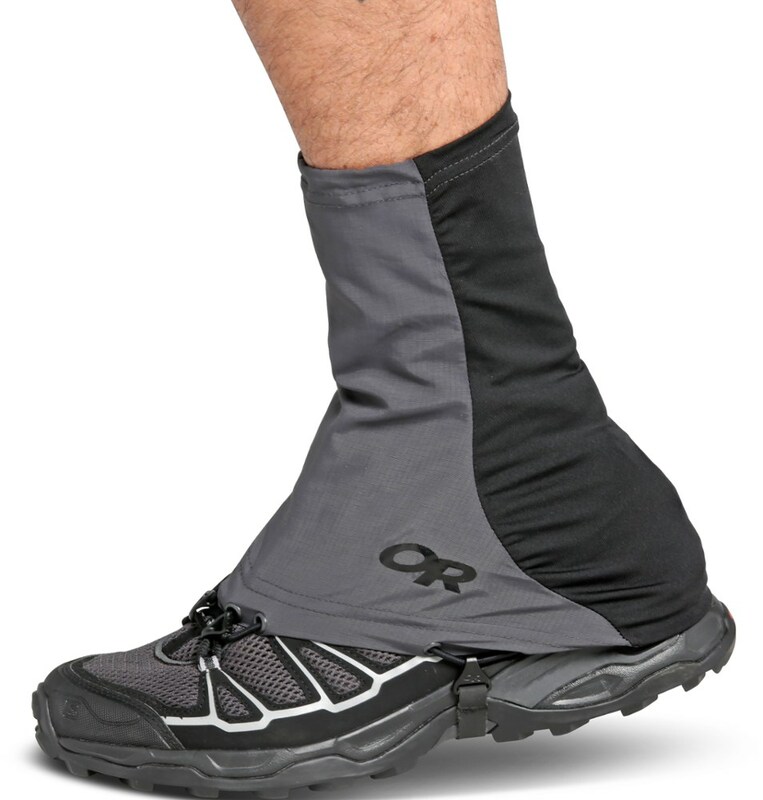 I haven't heard of these, but my husband and I both have the OR Stamina Gaiters (which are very similar). We are big fans! Thanks Ashleigh. 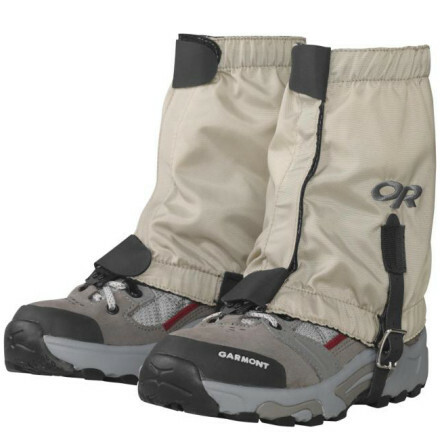 How do those Stamina gaiters fit around the ankles? 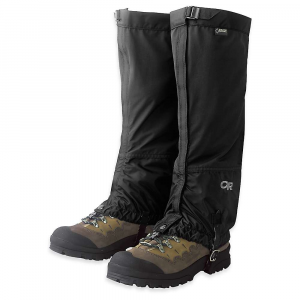 I had OR Ultra gaiters but with the cinch cord at the longest length they were already quite tight, while on my calves they were too tight. The Stamina gaiters fit me very well. I have the S/M size and I have average size lower legs for a lady. My husband has pretty large calves and he has the L/XL, which fit him well. I can see what you mean about the cinch cord though. Have you tried on the L/XL ones? They are actually pretty water-resistant, as well because of the silicon panels. 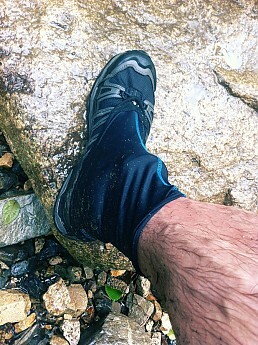 I use these gaiters for trail running and they effectively keep sand and pebbles out of my shoes. They attach to your shoes with a piece of velcro on the back and a hook for your laces in the front. They only come with one pair of velcro attachments so I used pieces of velcro from a sewing kit for my other running shoes. So far, so good. Welcome to Trailspace, Kellee. What type of trails do you typically run with these?